Many years ago I took a class at Parsons School of Design here in New York City. It was called Draping. It was an evening class and Parsons allowed the class to proceed even though at five students, it was one third the usual size. My classmates and I learned the technique of wrapping and draping muslin fabric around a mannequin in order to design (or replicate) a garment. Due to our small class size, we progressed rapidly and our very excellent teacher, Imogene Reznik, not only had the time to teach us core draping skills, she generously taught us core pattern making skills too. After many steps, involving the use of pins, chalk, markers, and a variety straight, square and curved rulers, those who chose to do so, got around to cutting and sewing "the good" fabric. I did not choose that option. 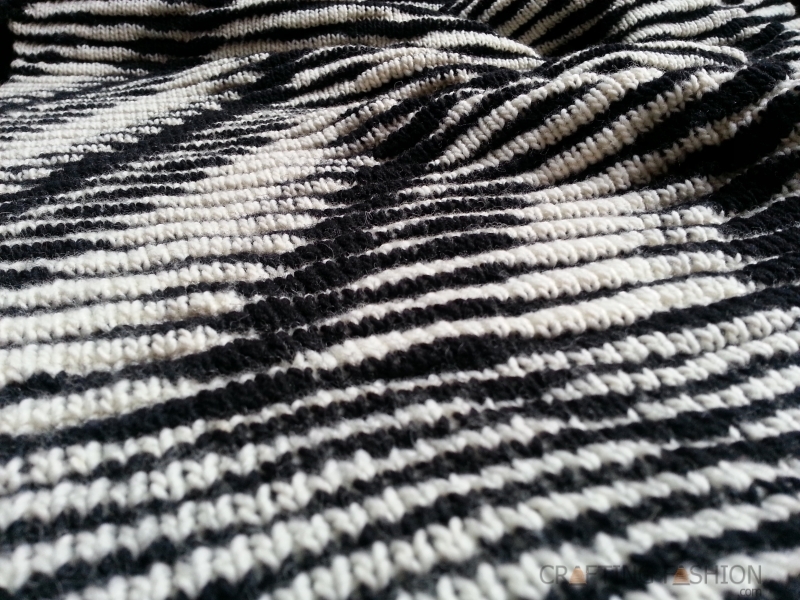 The original goal of this blog was to document the cutting and sewing of my sweater knit fabrics. When I saw Kollabora's Friday Challenge (#fridaychallenge) on the "timeless combo of black and white stripes", I thought I had the perfect motivation to work with a fabric I'd created several years ago, a rippled black and white stripe double knit wool. I even knew what I was going to do with it. But then I couldn't make the first cut. Back at Parsons my reason for not cutting "the good" fabric had mostly to do with the fact that I had chosen to do a knock off of a complicated "famous designer" wrap blouse as my final project. And I spent a lot of time doing it. Technically, this was a draping class. The final project had to be a muslin. There were no extra points for a finished public-ready garment. I spent my time getting drape and proper fit and later making pattern pieces just right. I learned a lot. It was time well spent. This time I didn't cut the fabric simply because I really like it as a piece of fabric. Maybe it's just that sometimes the fabric is the finished object. I've enjoyed washing and re-blocking this piece. I don't want to make it into a sweater. 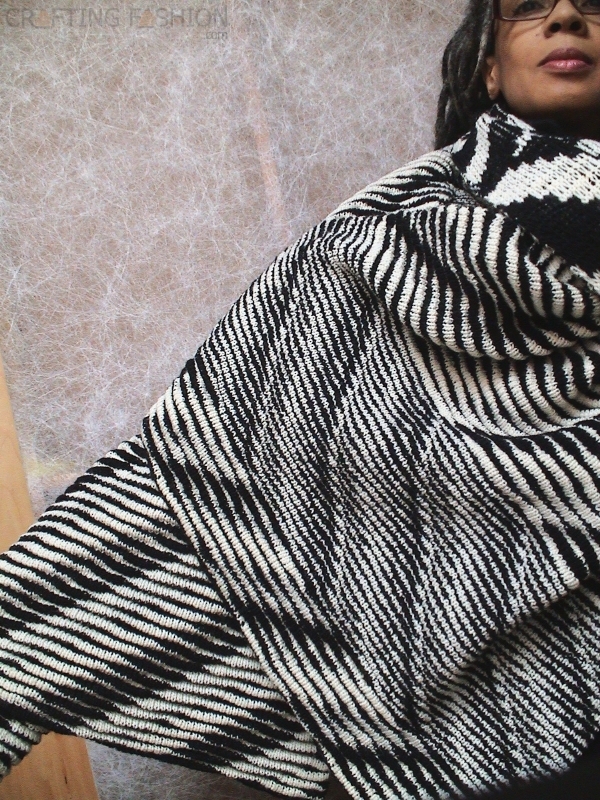 Wrapping and draping are just two more things to do with a sweater knit fabric. 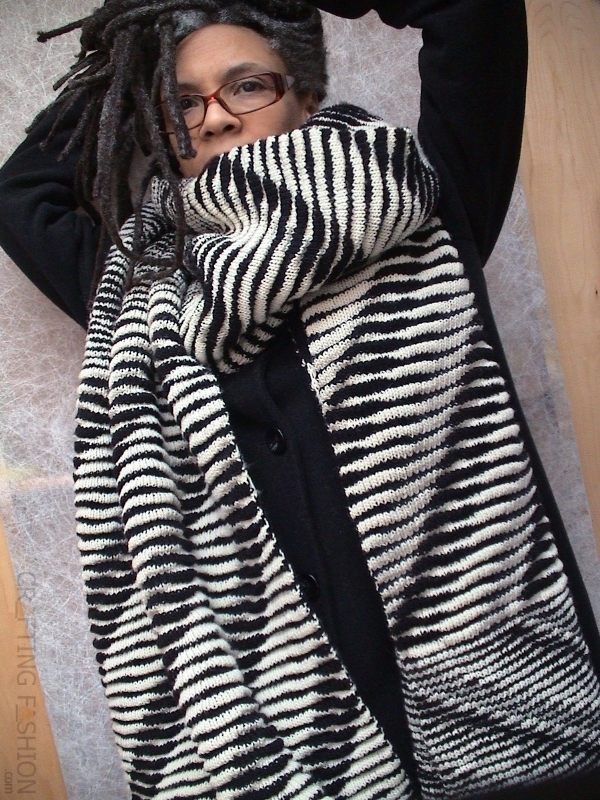 And it makes an excellent very, big scarf. I'll return to cutting and sewing next week. Onward. is this a racked ripple pattern? Thank you! Yes, it's rippled but not racked. More info over on Knitting in the fastlane. is this a racked ripple? what ever name it has ,its amazing. if you ever need help draping im your man. im an architectural designer i have my own practice and my own soft furnishing company we make traditional swags and tails for clients and each swag is patterned separately . ive been pattern cutting for swags for over 25 years. there is a kind of drapery called scarf drapery. its usally done with a voile or very light weight silk. its called practical drapery cutting. by E noetzli its still available in reprint.